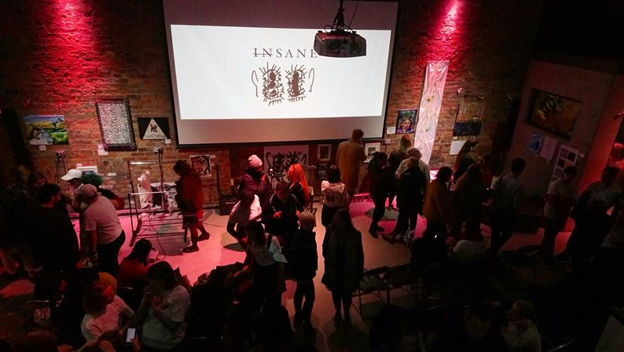 We are a student-led arts collective dedicated to changing the discussion of mental health issues; promoting understanding and empathy in a society that ignores, demonises and negates those who suffer from such issues. We need to raise £600 to make our next event happen – this will be a multimedia exhibition, hosted by N.I.A.M.O.S. in Hulme on Sunday 14th October. If we can raise the money, we will be able to provide a platform for 55 artists – many of them staff and students at the University - to showcase their work to the public and each other. All of these artists will be presenting work which explores their own unique experiences and journeys with mental health issues. We hope that our event will cultivate a more open and honest discussion surrounding the topic of mental health. 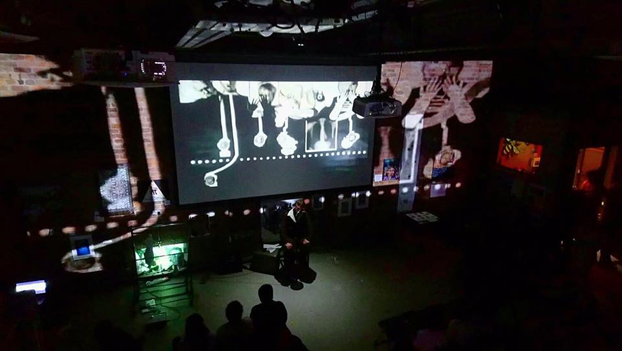 Our last event was hosted at Texture in March 2018. 52 artists took part and we had an audience of around 400 people. The sense of support in the room gave (in)sane an atmosphere of respect and openness. The connections made between artists and audience members has led to further collaborative projects, friendships and mentoring relationships – contributing an enormous amount to the development of students’ creative practice. What we ultimately hope is that each artist will find new hope in their mental health journey by creating something powerful and moving out of something that can make you so often feel powerless and stagnant. 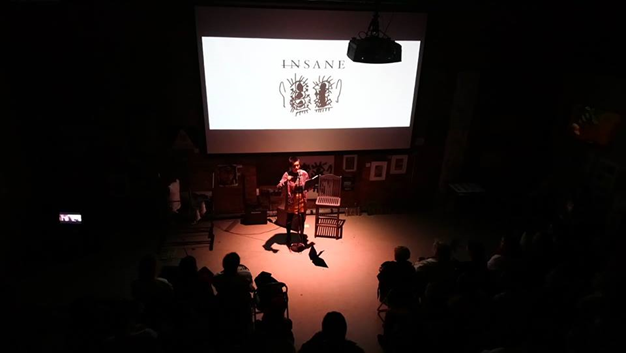 Numerous artists have put (in)sane on their CVs since the event, as many of them also volunteered in the running of the evening. Many of the artists who have continued to be involved have felt a sense of growth in their craft as well as confidence in their skills for self-promotion. If we can raise our full target of £800, we will publish a Zine alongside the event, with contributes from staff, students and other voices regarding the topics of mental health, dialogue and creativity. Though these are not all involved with the exhibition/event, we hope to publish more issues alongside other events and into the future. Cara Looij: Co-founder and Creative Director. Drama and English Lit 2018. Julia Morgan: Co-founder and Head of Social Media and Marketing. 3rd year Drama and English Lit. Sebastian Schmidt: Resident Technician. 3rd Year Music. Holly Huish: Administrative Assistant and Floor Manager. 3rd year MMU. Dee Dixon: Audio Visual Production Manager. Drama and Screen Studies 2017. We are tackling the topic of mental health and illness through the medium of art, to transform the ways in which we approach and tackle the challenges of the current global mental health crisis. Everyone who has helped to make (in)sane happen so far has had experiences with mental health, whether that be themselves or someone close to them. This is not unique to us - everyone has mental health fluctuations and everyone experiences pain at some point in their life. We have all found creativity immensely helpful in the journeys to overcome our mental health challenges and want to share this experience with others through the creation of a safe sharing space for this work to be exhibited. We have high hopes for the future. We are aiming to make a socio-political ruckus, because the mental health crisis cannot and should no longer be ignored. We hope that we can use art to make meaningful change and expand our organisation to find ways of making direct impacts on things like NHS waiting lists, government legislation and how mental health is handled in educational establishments. Our minimum target is £600 to cover the cost of making this event happen. Without this money, it simply can’t happen. If we raise more than our minimum target, we can pay for the printing of our Zine and posters. If our campaign is really successful and raises more than £800, we will invest this in future (in)sane events to grow our collective and make our impact more sustainable. Donations from alumni and supporters to The University of Manchester will match the first £300 you donate to our campaign, so if you can help us put on our event, the impact of your gift will be doubled. Thanks to the University’s charitable status, we can also claim Gift Aid to support our project – if you pay Income or Capital Gains Tax in the UK, please consider adding Gift Aid to your pledge. We have some great rewards to thank you for your support. If you’d like us to shout out to you on social media, please leave us a comment with your donation including your Twitter handle or Instagram name! Please share our campaign on your social media, Linkedin, email to friends and colleagues and any other way you can think of! We are not only seeing this as a fundraising platform but also as a way to promote the event and we'd really like to get the word out! If you’d like to come on the day, enjoy the artwork and get involved, tickets will be sold on the door for £5, and the venue will be open from 12.00-22.00. Thank you so much for taking the time to read this! If you feel you may be affected by certain triggers, please bring along a supportive friend or family member.